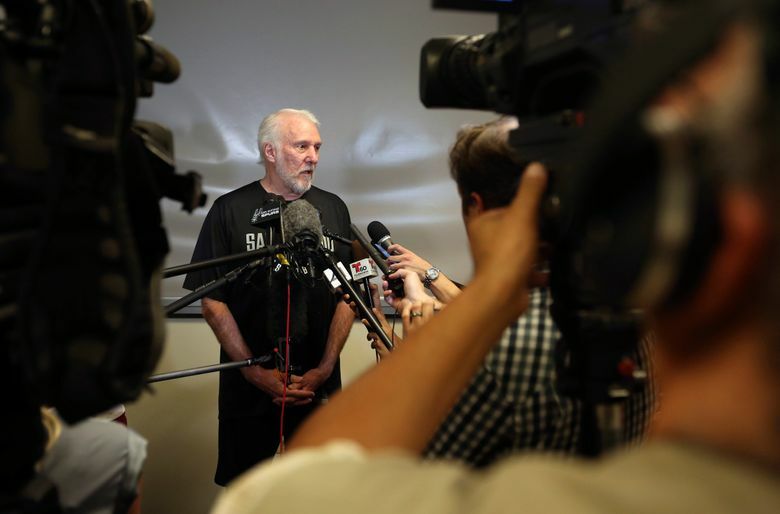 The Spurs coach brought a dose of perspective about how basketball fits into the world. This is what you call perspective. We now return you to our regularly scheduled programming of divas, whiners and malcontents. Basketball Hall of Famer Charles Barkley finished dead last at the American Century Championship celebrity golf tournament, but at least his wild tee shots were memorable. The words “get down!” hadn’t been uttered this much since the disco era. “Rocky Mountain Oysters” is among the five finalists to replace SkySox as the nickname of Colorado Springs’ minor-league baseball team. If Oysters gets chosen, “Hit the cutoff man!” ought to be a popular yell. So, there’s talk that Bryce Harper cheated to win the Home Run Derby because his pitcher-father didn’t wait for balls to land before throwing his next pitch? That’s a first — someone saying baseball could use some slowdown rules. Astros pitcher Justin Verlander and model wife Kate Upton are expecting their first child. In lieu of Johnson’s baby powder, they plan to use a rosin bag. Chelsea is about to be on its 11th manager since 2007 after firing Antonio Conte. “What’s so strange about that?” asked Chelsea GM Nigel Steinbrenner. Detroit and Cleveland came in Nos. 1 and 3 in WalletHub.com’s latest rankings of America’s most-stressed cities. People cheer for the Lions and Browns there. Any further questions? The minor-league Savannah Bananas’ rained-out game against the rival Macon Bacon — in which Bananas players will wear kilts — has been rescheduled for Wednesday, July 25. But why stop there? Kilt the umpire! A skunk ran across the outfield Monday night during a Pacific Coast League game in Reno. For some strange reason, groundskeepers, security officers and other potential first responders made themselves scarce. Delta Air Lines says it will trim some underperforming routes because of rising prices. Kind of like the Cowboys did with Dez Bryant. Ex-NBA player Charles Oakley was arrested on a gambling-fraud charge at a Las Vegas casino after allegedly getting caught on camera trying to take back a $100 chip from a losing hand. Which probably means he’s not known in betting circles as Ante Oakley. From the Sometimes These Items Just Write Themselves File comes word that Eagles coach Doug Pedersen scored — what else? — an eagle during the American Century Championship Celebrity Golf Tournament. “Sign me up for next year,” said Bill Laimbeer, coach of the WNBA’s Las Vegas Aces. France’s Kylian Mbappe, 19, notched a 65th-minute goal in last Sunday’s 4-2 win over Croatia to become the youngest player since Pele did so in 1958 to score in the World Cup final. Not that he’s young or anything, but Mbappe immediately dedicated his historic score to mom’s halftime orange slices. Marines are the heaviest drinkers in the military, according to a new study. Except, perhaps, for those three hours during the Army-Navy game. In other words, install a restrictor plate. Police in Fort Pierce, Fla., arrested John Mathews, 41, for disorderly intoxication after Mathews menacingly swung his boat anchor and cursed at high volume when another beachgoer allegedly ruined the chicken he was grilling. Prosecutors are reportedly pushing for jail time, court costs and anchor-management classes. Several players from Louisville’s 2013 national-championship basketball team are suing the NCAA for stripping them of their title because an assistant coach hired strippers to entice recruits. Lost in the fine print: They not only want their championship back, but any punitive damages to be paid in $1 bills, please. “Guys: I wish more women liked sports. “Us: Hey, I like baseball.